So I received a very good report from aunt Sally and Alison this evening. When they called, Alison was very talkative and making all kinds of great sounds on speakerphone. Sally went on to say that in her PT/OT co-treat session, they said she was sitting up and keeping her balance almost entirely on her own now! That's really good news. And during her PT session, she was lifting her left leg a few times on her own. More good news! When I called after work, they were watching the movie White Chicks - per the recommendation of one of the nurse aids. Sally said they really enjoyed it. So, overall, a pretty good report from Lincoln today. : ) On the home front, I've made the difficult, but prudent, decision to put our house on the market. So this week has been very productive in preparing it for listing next week - greatly due to the amazing help from some incredible friends. Thank you all so much. You've done an amazing job. But I've not told Alison of my plan, but am going to this weekend. She will certainly be as sad as I am to have to do his. But it's just a house, and we'll get to find another beautiful home together some day. This house is probably the least wheelchair friendly home imaginable, and it's bigger and more expensive than we need at this point. So if we can sell it, great. If not, I won't be too sad and we'll make it work somehow. 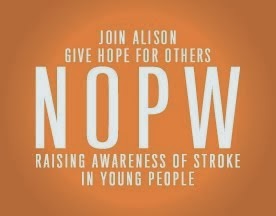 Thanks for all of your continued support as we continue to provide hope for Alison.